A few years ago, while driving with my family through the countryside of Bulgaria, I noticed how strikingly similar the landscape was to that of central Virginia. I also noticed that nearly every home had a garden plot, a grape arbor, and a cold frame of some sort. It made me realize how ancient and universal the practice of using cold frames is. A cold frame is a simple structure that utilizes solar energy and insulation to create a microclimate within your garden. For those of you who have harvested and eaten a salad of fresh greens in February or have flowers blooming well past frost, you know the attraction of using cold frames. You also know how easy they are to make and use. Although we have a greenhouse on our farm, space is always limited, so we rely heavily, especially in spring and fall, on our cold frames to overwinter plants, extend the growing season, start seeds, and harden off plants. For whatever purpose you want to use a cold frame, you need to keep in mind a few basic factors. First, some plants fare better in cold frames than others, with low-growing, cool-season plants being the best suited. Second, the type of cold frame you use dictates how much protection you can offer your plants. In all cases, the main conditions you need to monitor and control are temperature, sunlight, moisture, and wind exposure. In a sunken cold frame, the ground insulates and the sun gives warmth, but you still need to eliminate pockets of cold air that can harm overwintering plants. If you love to use tender or tropical plants in your garden but don’t know what to do with them come fall, a cold frame provides a simple solution. It is not a greenhouse: You won’t be able to keep your plants growing lushly through the winter months. But you can provide plants with the right conditions for a gentle dormancy, and they will be eager to resume growth come spring. I keep tender plants in a sunken cold frame, as it provides the best and most consistent insulation. 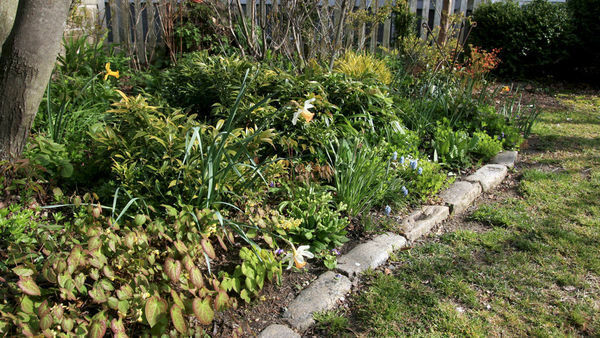 Although my garden is in USDA Hardiness Zone 7, I can reliably overwinter plants that are hardy to Zones 8 or 9—and occasionally Zone 10 if we have a mild winter. To keep a tender plant in a cold frame, cut it back as much as possible before the first fall frost. If the plant is not already in a container, lift and sink the root mass into a large plastic pot, with plenty of room for soil to insulate it. Pack the cold frame tightly with pots, and add leaves or mulch over the soil surface and into any significant air gaps. Make sure all the pots are well watered. Once you have your tender plants stored in a cold frame, you will need to control the weather conditions to maintain a healthy dormancy. Keep the soil moderately moist but not wet; the plants won’t need much water over the winter and will rot if overwatered. They should not receive much sunlight, either, because this will encourage active growth. 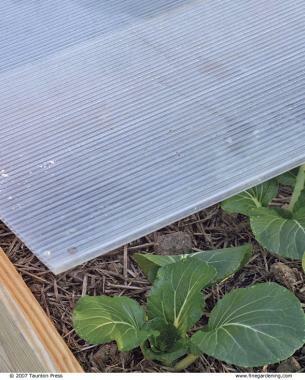 I like to use a white plastic cover on my cold frame as it limits the amount of light penetration and moderates spikes in daytime temperatures. 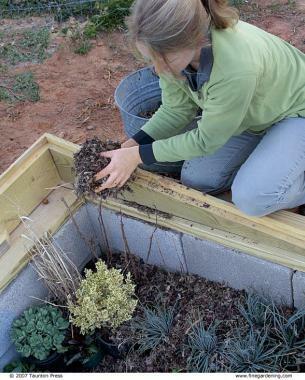 Temperature fluctuations can be harmful to dormant plants and should be minimized by venting the cold frame. As a general rule, if it’s 35°F to 40°F and sunny, you should open the frame partway, while at 45°F to 50°F, you may need to open it up entirely. 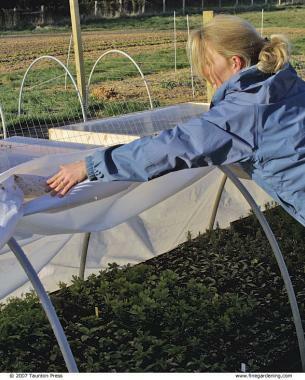 Using a sunken cold frame or siting your aboveground frame near a windbreak offers much-needed protection from exposure. This is especially important for those plants that may retain some foliage in winter. While heat and humidity are important for germinating seeds, excessive heat (above 90°F) can damage fragile seedlings. A min/ max thermometer hung on an inside wall of the cold frame is a great way to monitor temperature fluctuations. 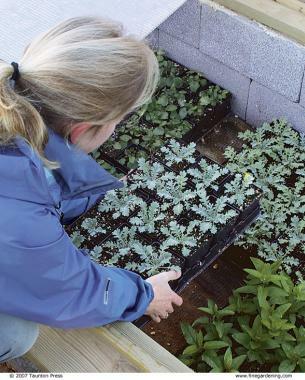 Seedlings grown indoors can move outdoors weeks earlier if you use a portable cold frame. 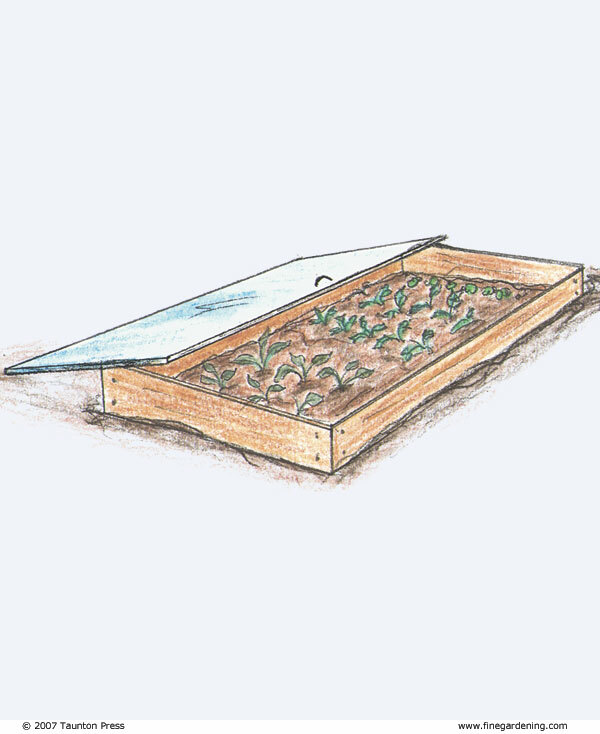 Prevent disease on seedlings started directly in a cold frame through frequent venting. Whether you are starting seeds in flats or sowing them directly into the soil, a portable cold frame provides the opportunity to get your plants going a few weeks early, and it eliminates the transplanting shock that many plants face because they will be better acclimated from the outset. If you are seeding in the early spring or fall, focus on cool-season plants, as they tend to have lower temperature thresholds for germination. Keep in mind that seedlings are more susceptible to extreme weather conditions than established plants. If you are sowing directly into a portable cold frame, have it in place two weeks prior to seeding to warm the soil for germination. Whatever method you are using to start your seeds, make sure to keep the seedbed evenly moist. Once seedlings have germinated, the cold frame should be vented more frequently to discourage damping off by increasing air circulation. If you start your seeds in a greenhouse or indoors under lights, you can start them a good six weeks earlier than usual and transplant them to a cold frame you’ve placed in your garden. 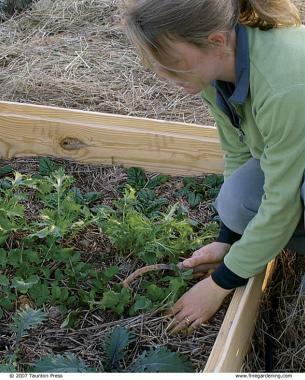 It helps to have the cold frame in place at least two weeks prior to transplanting to warm the soil. Again, you will need to pay attention to the degree of sunlight, moisture, temperature, and wind. The frame also provides a windbreak while the plants are still small. Because you’re encouraging active growth, you will want to use a transparent cover of plastic or glass. The soil will dry out more quickly inside the cold frame than outside, so be sure to keep the soil moist, especially while the plants are acclimating to their new site. Keep in mind that more plants die of excessive heat and drought in cold frames than from cold damage. Proper ventilation is particularly important for cool-season plants. 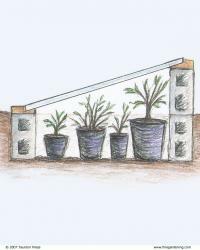 If you have established transplants, vent the frame when the outside temperature is 40°F or higher. If your plants are closer to the seedling stage, you may want to wait until the outside temperatures are 45°F to 50°F before venting. We use three different types of cold frames on our farm, depending on the plants we are working with and what we are trying to achieve. 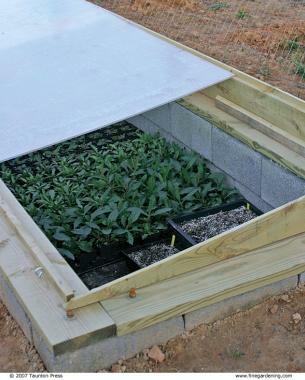 A sunken cold frame with cinder-block walls and a rigid plastic cover is best for overwintering tender plants and hardening-off seedlings. A plastic hoop tunnel warms the soil for spring seeding and protects frost-sensitive plants in spring and fall. A portable wooden frame with a rigid plastic cover extends the harvest season of cool-season vegetables and allows us to direct-sow seeds earlier in the spring. Instead of carrying plants in and out of the house every day, simply open and close the lid of the cold frame to acclimate plants to the outdoors. 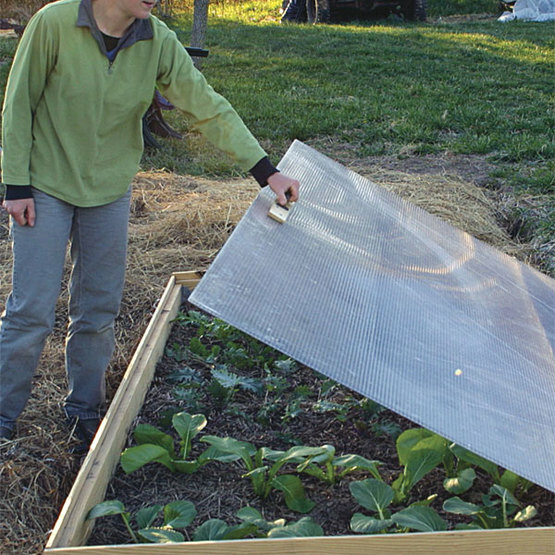 Like a car on a sunny day, cold frames can heat up significantly. 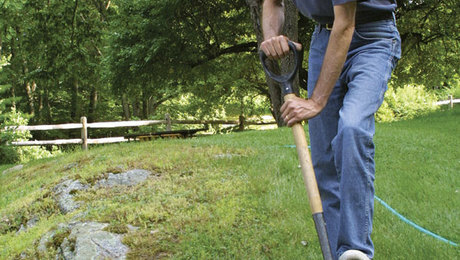 Proper venting will limit possible damage to your plants. When plants are moved from a warm, sheltered location—such as a greenhouse or indoors—into the garden, they must be gradually acclimated to fluctuations in temperature, sunlight, moisture, and exposure. Generally this is done by carrying the plants outside and back in again for gradually longer periods of time over the course of a week or two. The same effect can be achieved by opening and closing a cold frame over a five- to seven-day period. The key to a trouble-free hardening-off period is to keep track of the extended weather forecast and plan accordingly. If I am moving out cool-season or young perennial plants from my greenhouse, I will wait for a stretch of weather where the lows don’t fall below 35°F. Even if the temperature drops after this period, plants hardened off and growing in a cold frame will be fine. For warm-season plants, I wait until the temperatures have stabilized and we are within two to three weeks of our last frost date. In general, wait until seedlings have formed multiple sets of true leaves and are well rooted before moving them into cold frames. Once the plants are packed closely into a frame, start venting the frame during the warmest part of the day, gradually increasing the length of time the frame is left open. If you are not able to tend to the frame during the day, try to time the onset of your hardening-off period with cloudy weather, and start by venting the frame just a crack, gradually increasing the open gap each day. As plants acclimate to cooler temperatures, more direct sunlight, and wind exposure, their foliage will often thicken and darken in color. New growth is also a good sign that the transition is going well and your plants are ready for their final move into your garden. If you can’t bring plants to a cold frame, bring a cold frame to the plants. Some PVC and rebar make the frame for a hoop tunnel. Plastic over the tunnel keeps plants warm at night, but it should be lifted during the day. If you dread the coming of the first fall frost, you can extend your growing season with a plastic hoop tunnel. 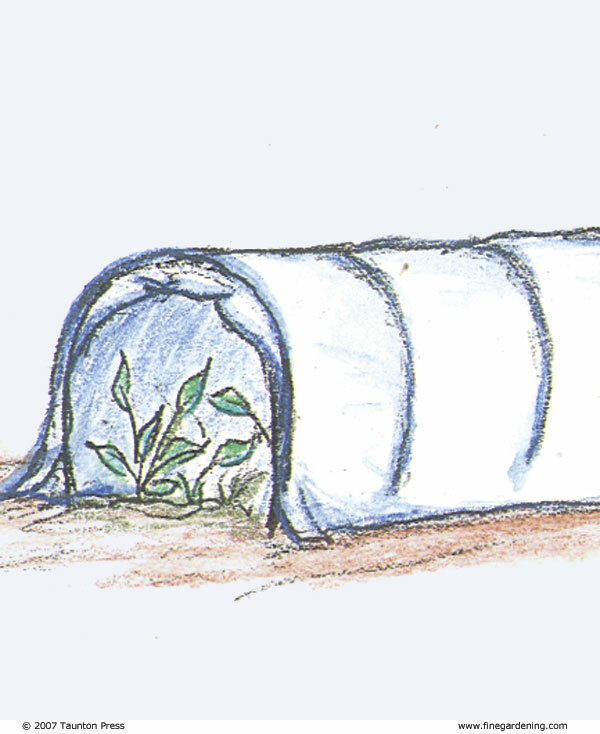 While not a typical cold frame, a hoop tunnel provides the same benefits by insulating the plants inside and keeping frost at bay. 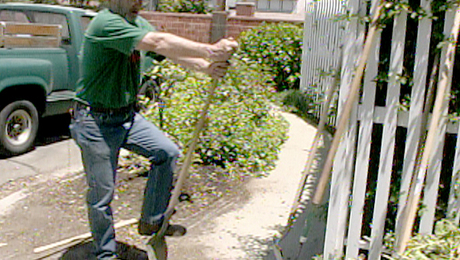 An easy and nondisruptive method is to sink 12- to 18-inch metal stakes into the ground and slide 6-foot sections of electrical conduit or PVC pipe over them, creating an arch. 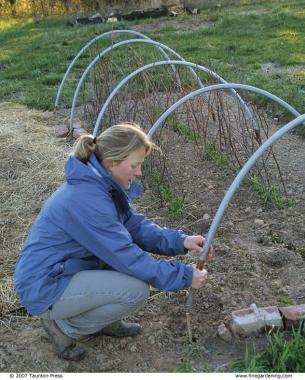 You can then stretch plastic over these hoops and protect the plants underneath from nighttime temperatures and frost. 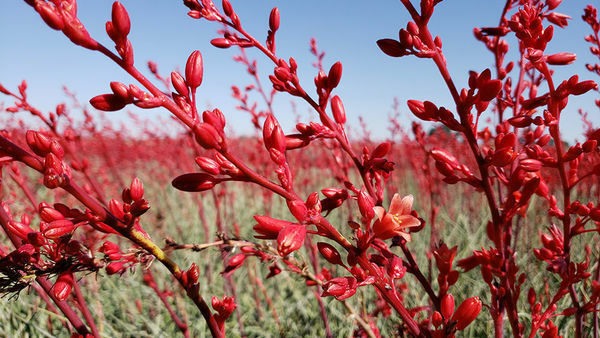 These plants have been hardened off naturally to colder temperatures by the onset of fall and generally don’t need to stay covered during the day, provided the outside temperatures are above freezing. 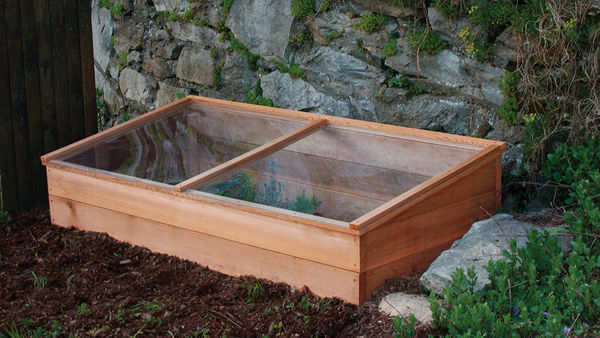 Want to build a cold frame? It depends on your vegetables. Where do you live? What zone? Hello. I live in Minnesota. 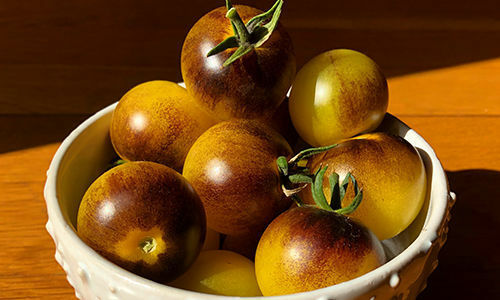 I picked up potted tomato plants at Costco yesterday, and they reside in my kitchen when it drops below 50, which will easily be Mother's Day. I'm wondering if I build a cold frame out of 2x4 and encase in clear plastic sheeting, to what temp would they be protected? The frame would be on a patio under a south facing deck. Lots of light, but no direct sunlight. I'm thinkmg they should be elevated off of the brick sirface too? Thanks! Does it matter if my cold frame faces North? Very helpful and nicely explained. I too am wondering about when to start indoor seeds, with the intention of moving into the cold frame. We are in zone 5/6 in Northern Indiana and this year it is a very cold and snowy winter so far.